The police officer seen on video apparently verbally abusing an Uber driver in an at-times xenophobic roadside tirade in the West Village earlier this week has been placed on modified duty and transferred, Police Commissioner Bill Bratton said Wednesday. "That officer's behavior reflected poorly on everyone who wears our uniform," Bratton said at a news conference before apologizing to the driver and the two passengers. Officials with the NYPD's detective union said earlier the officer seen in the now viral video is a member of the NYPD's Joint Terrorism Task Force, an elite group that handles counterterrorism cases in the city alongside FBI agents. The union said in a statement that the officer was leaving the hospital, where he was visiting a injured fellow officer, at the time of the rant. "He really should not be judged by one isolated incident," said Michael Palladino, the president of the union. 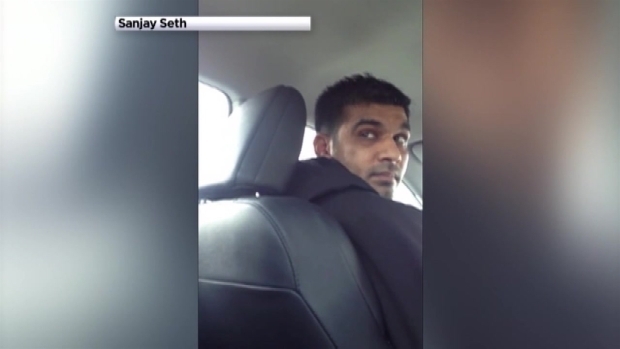 The NYPD says its Internal Affairs Bureau is investigating a video that appears to show a man who indicates he is a police officer verbally abusing an Uber driver in an at-times xenophobic tirade in the West Village Monday. Bratton disagreed, saying, "In that kind of encounter, anger like that is unacceptable. In any kind of encounter, discourtesy like that and language like that is unacceptable." "No good cop can watch that without a wince," he said. "All good cops know that the officer just made their jobs a little bit harder." The altercation, which was captured on video by one of the Uber driver's passengers and has been viewed more than 600,000 times on YouTube, is being investigated by the city's Civilian Complaint Review Board. The passenger who captured the video, Sanjay Seth, tweeted on Wednesday that he had been interviewed by the body. According to Seth's YouTube post, his Uber driver honked his car horn at the officer later seen screaming in the video because the officer was trying to park on a Sixth Precinct street in the middle of the afternoon without using any blinkers or hazard lights, and the Uber driver's path to a green light was blocked. The officer, seen wearing a green tie and blue shirt at points in the passenger video, got out of his unmarked car, which had flashing blue and red lights on the dashboard, and flagged down the Uber driver. The three-minute video begins as the officer approaches the Uber driver's window and starts yelling at the driver, raising his voice over the Uber driver's muted apologies and efforts to interject. "Stop it with your mouth, stop it with your, 'For what, sir,'" the officer is heard saying in the video as he curses. "Stop it with that ... and realize the three vehicle and traffic law violations you committed." "You understand me? I don't know what [epithet] planet you think you're on right now," the officer yells, making fun of the Uber driver's accent. The officer then slams the hood of the Uber car and walks away; the Uber driver tries to apologize to his passengers, who tell him it was not his fault and inform him a video of the exchange was recorded. One of the passengers said it appeared the officer was on a "power trip"; the other called the man's behavior "really inappropriate." The officer returns to the Uber car about 90 seconds after slamming the hood and storming off, the video shows, and continues to curse at and belittle the driver. The driver keeps trying to defuse the situation with respectful apologies. Then the officer goes off on him. "I don't know where you're coming from or where you think you're appropriate in doing that," the man yells, apparently in reference to the car honk from earlier. "That's not the way it works. How long have you been in this country?" Dad of Baby Allegedly Smothered to Death in Midtown Restaurant "Shocked"
"Almost how long? Two years?" the officer yells after the driver whispers a response. "I got news for you, and use this lesson: Don't ever do that again. The only reason you're not in handcuffs going to jail and getting summonses in the precinct is because I have things to do. "That's the only reason that's not happening, because this isn't important enough to me, you're not important enough," he says. The officer turns toward the passengers in the back seat, asks if they are fares and says something about the Uber driver wasting their days, too. The officer hands the driver some kind of piece of paper that looks like a ticket and leaves as the passenger cellphone video pans to the flashing lights on the dashboard of his vehicle, parked behind the Uber car. Seth posted video of the exchange on multiple social media accounts. On his Facebook page, he wrote, "Our Uber driver, Humayun, was abused by a police officer today in New York. The rage, door slamming, throwing items into the car, threatening arrest without cause was bad enough -- but the officer's remarks at the end really took it to another level." Seth wrote on Facebook that he reported the exchange to the Civilian Complaint Review Board. According to his profile, Seth works at a nonprofit in the city and used to work for the parks department. Asked about the exchange by NBC 4 New York, Seth wrote, "This very unfortunate incident is between the driver, Uber, the officer, and the relevant authorities." Uber called the behavior in the video "wrong" and "unacceptable," and said it appreciated the NYPD investigating. "We are in touch with our driver-partner who was subjected to this terrible experience and will continue to provide any support he needs," Matthew Wing, a spokesman for the ride share company, said. Bratton said Wednesday: "I want to extend an apology to the driver of that vehicle and the two passengers in that vehicle for the behavior of that officer." The CCRB handles complaints about four kinds of alleged police misconduct: force, abuse of authority, discourtesy and offensive language. Bratton said "the actions engaged by the officer based on the video alone would indicate that those fall under the jurisdiction of the CCRB and their particular areas of jurisdiction."